My nephew Evan is now a big brother! I just got the call from my mom...my sister had a boy! Rowan Avery is his name and he weighed 8 pounds 14.5 ounces. I've been waiting for the news this morning...and now I need to go get in the shower and run to the school to tell my daughter. I was instructed to let her know right when I found out. I think she might be a little disappointed...as she was hoping for a girl cousin. It is funny...through out my sister's pregnancy I was thinking she would have a girl, but today I could only think that it would be a boy! We are going to Denver to meet him tonight...I can hardly wait! :) I will try to post pictures soon. Also, to reply to your comment, I would be honored if you added me to your list! That is one big baby!!! I love that his initials spell RAG, the possibilities are endless. He needs to get started on a Raggedy Andy collection. 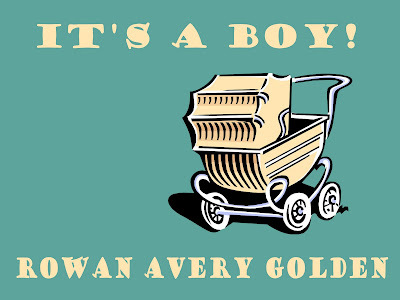 Congratulations on your new baby nephew! It's always fun welcoming new additions to your family. I like the name Rowan. How fun! new babies are the best! Especially when you can kiss them, snuggle them, breathe them in and then give them back! Cute name too! Congratulations!! such a cute new newphew.